When you’re involved in a car accident and suffer substantial injuries, getting back to work or performing the work you did before the accident can sometime prove to be a lengthy, uphill battle. A serious car accident can change your life forever — physically, mentally, and emotionally. But such an event can also permanently alter or reduce your earning potential forever. Being hurt and recovering from an accident is bad enough, losing a lifetime of paychecks, however, can be devastating. Not just for you, but also your family. So how do you ensure that you’re fairly compensated for the loss of earning capacity when you file a personal injury claim with an insurance company? Chances are that the insurance company won’t agree with your estimate, in fact, they’ll likely try to refute your calculations. Here’s what you should consider. In Texas, a plaintiff can recover damages for loss of earning capacity as part of his or her standard personal injury claim. These damages include the loss of past and future wages. Earning capacity is what a person could reasonably make based on his experience, education and other factors. For example, if a construction worker was hit by a city bus and suffered a spinal injury, he may never be able to work in that industry again, even if he had more than two decades of experience. In this example, his loss would be what he would have earned if he could have continued to work in construction less any amount that he can make doing a different job. In the case of wrongful death claims, loss of earning capacity is treated a little differently because the law requires you to take into account a person’s individual consumption and subtract such amount from the damage number. Past earning capacity refers to the period after the injury and the date of the trial, so, let’s say six months after the accident. In these six months, what was the injured person’s capacity to earn, and to what extent was that capacity affected by the injury? If the injured person had plans to travel overseas on a federal contract and earn a certain amount for that contract — although it’s not part of their regular wages, it could be argued that the value of that contract should be included as past earning capacity. Future earning capacity refers to the injured person’s diminished capacity to earn a living after the trial, such as the construction worker we described earlier. If he is no longer able to work in this profession and has developed a lifelong skill set and level of technical ability that merits a higher pay, his ability to continue earning those wages, and perhaps more, could be factored in their future earning capacity. There are no hard and fast calculators for every case, but an experienced lawyer can help you collect enough documentation and evidence to make a strong case for both loss of past and future earning capacity. It’s with this information that a jury will decide what that capacity is, and what’s fair. Because a jury decides this critical amount of your settlement, you should work closely with your lawyer to document your past and potential earning capacity in a way that makes your ask clear and definitive. In the case of the contract worker, for example, he should have a written letter or e-mail proving that his contract was cancelled, that he was unable to execute that contract because of his injury, and the value of the original contract. 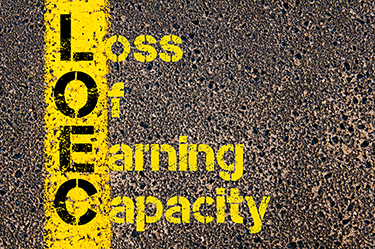 There are several other factors to consider when calculating the loss of past and future earning capacity, many of which depend on your past profession, professional skills, and work history. If you feel that your loss of earning capacity has not been adequately calculated or you have questions about what documentation you may need, call an experienced personal injury lawyer who can help walk you through the process.